I thought it might be fun to share my creative process when creating a new painting. 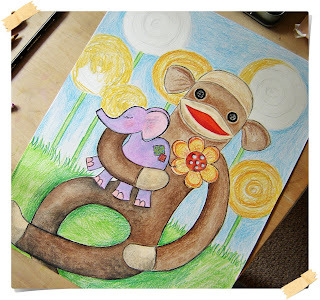 My latest craze is sock monkeys and I am trying to build up a sweet little collection of them. 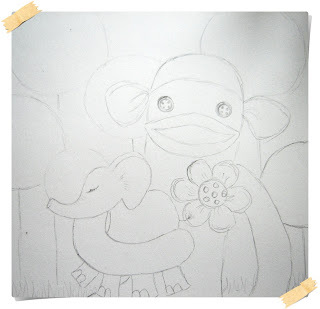 Here is the birth of a Silly Sock Monkey: the new and adorable Jeffrey and his plushie pal, Ellie. Meet Jimmy. 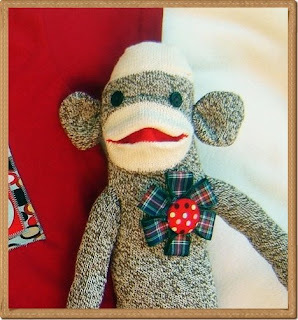 This was the first sock monkey I ever made, using original Rockford Red heel socks. I sold him back in the days of my baby boutique, Tootsie and Grace. 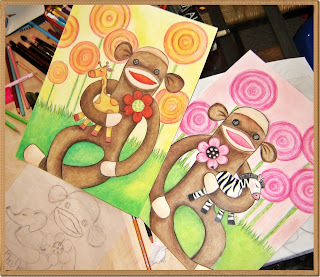 Luckily I took pictures, because he is the inspiration behind my collection of Sock Monkey paintings. For every picture I create, I have inspiration from something. It might be as simple as a sweet tooth which can never be filled-- which led to my Delicious Things collection, or a random line drawn into my sketchbook, which looked like a snobby nose-- and led to my Elegant Snobbery collection. She Wore a Beehive for a Hat was inspired by a picture of a bee hive I saw in a Country Living magazine, and from that, I also sketched several other unique hat wearing ladies. And my Miss Muffet picture came about when I saw some cute little illustrations in a vintage children's book, and I wanted to create a collection using the vintage pictures in the background. It doesn't take a lot to find inspiration! Here are my tools. If you are familiar with colored pencils, you will notice I am using Prismacolor, which are not my favorite colored pencils, but certainly do the trick. My collection of Design Spectracolor is wearing so low, that I am trying to be a big girl and wean myself early, so I don't have a nervous breakdown when the last of my most fabulous pencils in the world are gone. I'm handling things pretty okay, I think! * The pencils I will need for the picture. I like to plan my color palette before I begin, so I don't end up with some crazy color issues once I have started. * My pencil sharpener, which I use every 35 seconds as I am a compulsive pencil sharpener. 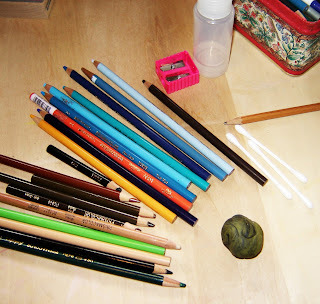 * My kneaded eraser, which I use to dab over my illustration, first to pick up extra graphite and later to pick up extra colored pencil dust, so that I don't end up smearing the pencil dust as I work. 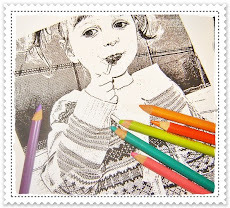 Colored pencils are permanent, and even the smallest specks of pencil dust will make the picture look smeary and awful! * Solvents (which are very toxic, and even the fumes are flammable, so be soooo careful when using these! 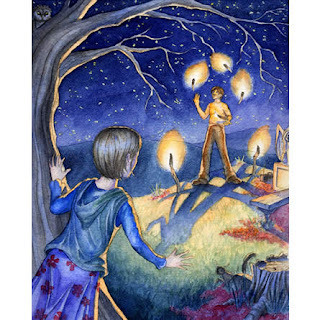 Make sure you don't have candles burning nearby and ventilate your workspace well) which melt the colored pencil into the paper and create an almost watercolor effect. I use q-tips and tortillons to apply. 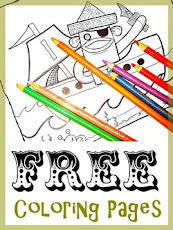 * Colorless Blender, which is the tan colored pencil with the clear tip. This is the pencil I use to blend my detail areas into the paper. It is pretty fabulous!! Tracing paper is an artists best friend. I draw all my sketches onto tracing paper, because it erases beautifully, and doesn't leave my sketch paper filled with hard to erase pencil marks. 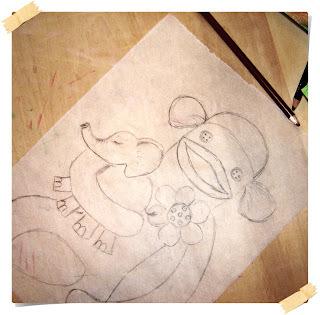 From the tracing paper, I use a light box to transfer my drawing to my final paper. My friend Brian uses graphite paper to transfer his drawings, so really it is up to the artist. I adore my light box, though. Pencil lines are permanent, no matter how light you get them. I need to transfer my work on a paper that has no previous pencil lines or eraser marks, because the colored pencils will pick up every single mark etched into the paper. Really annoying, so I can't mess up!! After the picture is transferred, I use the kneaded eraser to pick up all extra graphite, so I have very faint lines that wont show up as I add my color. I then have to tape my work to my drawing board, so I don't slide my picture around. I have been known to ruin pictures from crinkling the paper while I draw, so this is a HUGE step for me. Here is my "ugly picture" phase. It is a good thing that I know my picture will eventually look alright, because this ugly phase is looooong, as I apply and blend layer after layer of color. I generally work small areas until they are done, but sometimes if I am not sure of my color palette, I will work the whole painting at the same time. 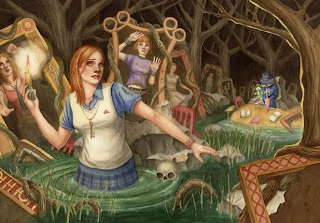 There is nothing more annoying than finishing the foreground, and then screwing up the color in the background!! You can see better in this picture what is finished and what isn't. 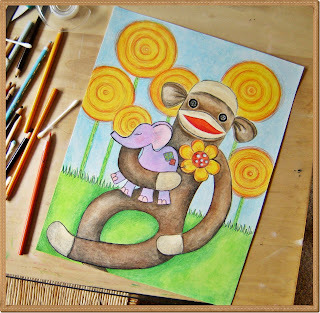 I still have some work to do on the shading of the monkeys body, the blending of the grass, the background and the lollipops, but the elephant is completely finished. I usually like to finish my favorite areas first, and I thought that elephant was pretty cute!! Layering the colored pencils takes awhile for me. 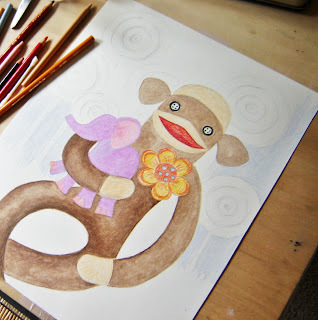 I love layers and with colored pencil, you have to start light and then work darker and darker. I generally just layer an area until I get bored, so luckily I don't usually go too overboard with my color!! And here is Jeffrey and little Ellie, all nice and finished!! I think he is my favorite sock monkey yet!! 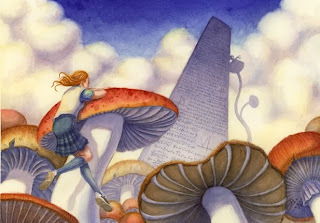 Children's book illustration is where I hope to end up some day. 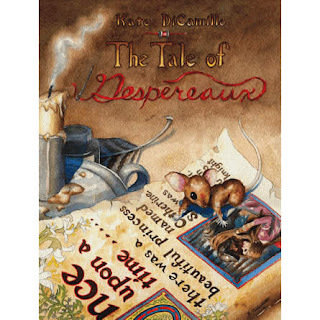 I have wanted to write and illustrate children's books since I was young and still have a whole slew of Young Author's Faire books written by yours truly on my book shelves. 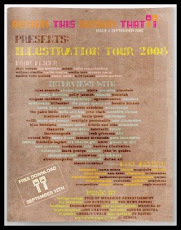 But my favorite artist is, without a doubt, Brian Nishimoto. I discovered Brian's work at my local library a few years ago. My library had a gallery set up for local artists and when I saw Brian's amazingly beautiful watercolors I just could not stop staring! I got his email address from the librarians and sent him an email asking if he gave lessons. While Brian didn't give lessons, he was looking for a painting companion and he found that in me. For a little over a year, Brian and I met every Thursday and painted together. Now, I'm no watercolorist. After a year of getting my hands dirty with Windsor & Newton, I called it quits and went back to my Design Spectracolors. But in that year I learned a lot about the creative process. I also finally gave myself a chance at being an artist. Brian and I entered a competition together. I found the W.I.N Competition in a book on children's book publishing and we each entered. 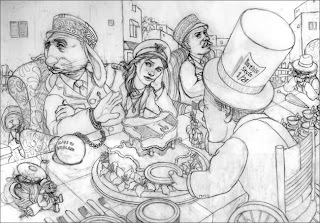 I entered in the Dummy book category (the requirements were to write and illustrate a 32 page children's book with 4 full color spreads and the rest in black and white) and Brian entered in the Illustration category (the requirements were to send in one full color book cover). I didn't win (though I did hear that I made it into the top ten in my category-- hurray!!) but Brian was given an Honorable Mention... and picked as the editor's favorite! Very well deserved! Brian is a very modest guy and will be horrified to read my incessant praise, I'm sure! 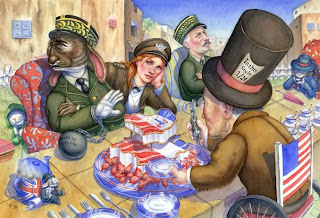 But before I go, I have to show off some of his work, which you can find on his website ModestMuse.com. I'm sure you will be just as blown away as me! When my family packed up and moved to Texas a year and a half ago, ending my Thursday night painting sessions with Brian was one of the hardest things I had to do. We still keep in touch and show each other our latest work through emails, but it sure isn't the same as sitting across from each other each week and watching sketches come to life with each layer of paint. I hope you enjoy his work as much as I do! I know Gracie is a fan. As a parting gift, Brian gave me a framed copy of his The Little Mermaid illustration (my favorite!) 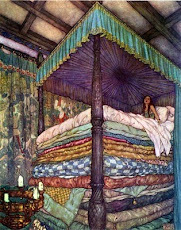 and it hangs in the girl's room. Even his pencil sketches are a work of art!! And another note before I go: the sketchbook Brian gave me (another parting gift) is where each of my elegant snobs was born. We may not paint together anymore, but I am still inspired! 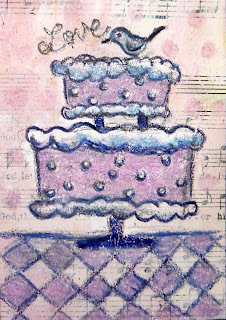 I'm back on an ACEO kick. I just can't help myself. 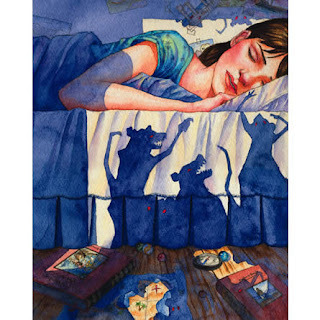 For those of you who are not familiar with ACEOs (or ATCs), they stand for Art Card Editions and Originals or Art Trading Cards, and measure 2.5 x 3.5 inches. 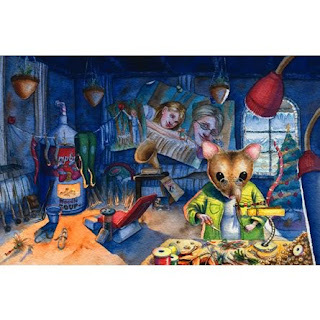 They are wonderful little collectibles and the perfect way to own original work without breaking the bank. They are also highly addictive to make and highly addictive to collect! I love getting my fingers messy with collages. These little things are very satisfying and don't take hundreds of hours to put together. Plus, they are so tiny they can just fit in your pocket. I am a firm believer that tiny things are the cutest things. 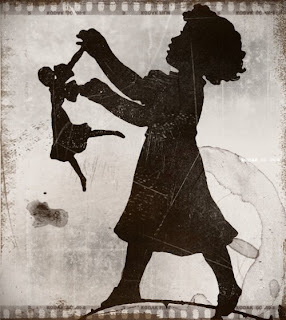 I have also been itching to use the vintage children images that I purchased from Art-e-ology a while back. This card is made with vintage text from a 1904 copy of a Shakespeare play. 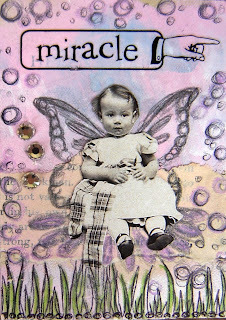 The little girl image is copied from a vintage photograph and embellished with ink, acrylics, pencil, the rub on word "Miracle" and three Swarovski crystals. 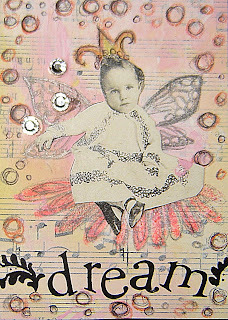 This ACEO is made with vintage sheet music. The little girl image is copied from a vintage photograph and embellished with ink, acrylics, pencil, rub on word and three shimmery Swarovski crystals. 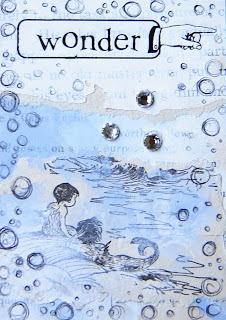 This ACEO is made with a vintage mermaid children illustration and text from a children's book published in 1908. Embellished with acrylic paint, ink, pencil, rub on word and Swarovski crystals. 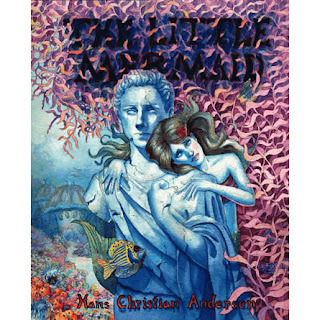 This one is my personal favorite, as I am a mermaid collector. I secretly hope no one buys this one, so I can covet it forever!! I wanted to be more loose in my drawing style with this ACEO. These cards are great for experimentation, and usually my style is very controlled and precise. This one was fun for me!! 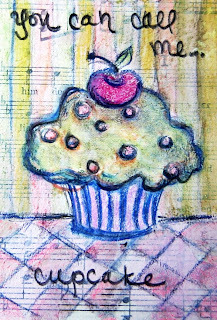 This sweet cake is drawn in colored pencils and drawing pencil, on vintage sheet music and acrylic paints. 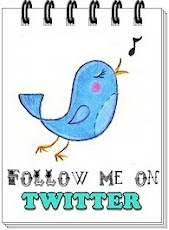 A sweet little birdie sits on top and reminds you to love!! Again, I was having fun with a loose style. I think it turned out pretty cute! 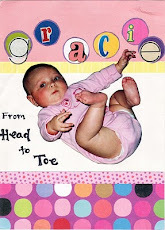 If you have never made an ACEO before, you gotta try it! Throw your inhibitions to the wind, pull out whatever art supplies, glue, glitter, whatever you have and play around. 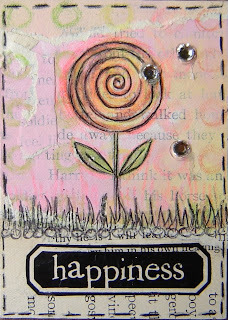 You just might become an ACEO addict, too! Its Never Too Late for Glitter Eggs! Egg decorating came late in our household. Not as late as our Halloween pumpkin cookie decorating which we didn't start until mid-November. Or our Christmas gingerbread men cookie making which we didn't start until February. But we did only just open the Glitter Egg decorating kit this morning. Gracie didn't mind. 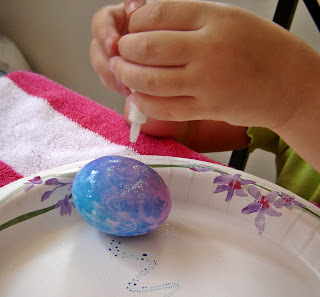 I guess to a three year old, glitter eggs are magic no matter when they are created! 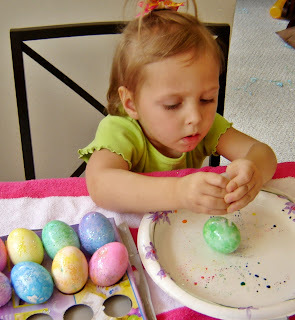 The best part of our egg decorating, was that Gracie could pretty much do the whole thing herself. 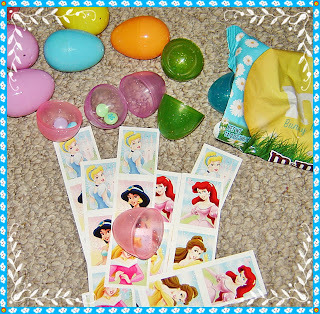 The eggs and dye were placed into baggies before covered in glitter, so the project was fairly mess-free. 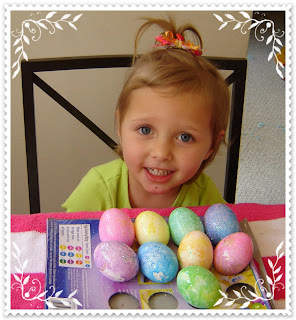 And Gracie was so proud of herself and her shimmering, glittery eggs, that she actually smiled at the camera without bribes and begging! 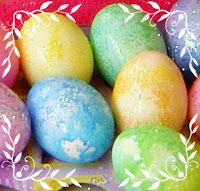 We may just have to hit up the store for their half price after-Easter egg decorating kits, so we can make some more next week! 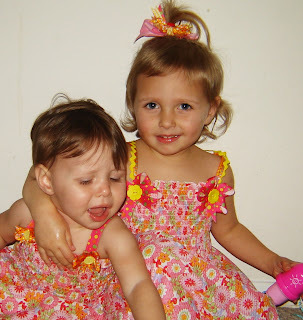 I have always wanted to make cute little spring and summer dresses for my girls, but as I lack the ability to read a pattern, my dress making skills are limited. Naturally, when I found some adorable pre-shirred fabric at the craft store, I jumped for joy. I am all about cheating (Not in school, of course. I cheated on my state capitals test in 5th grade and that was the last cheating I ever did in school. I still feel guilty!). When it comes to shortcuts and tricks to make the job quicker and easier... I'll cheat away! I just sewed a straight seam up the back, added some coordinating ribbons, rick rack, and buttons for the shoulder straps, made each girl a matching hair bow and... Voila! 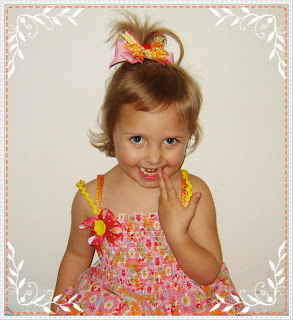 The best part is, Gracie has proudly declared several times now that, "Mommy made my dress." Now if only I can get the girls to sit next to each other and smile for one (just one, thats all I ask!!) nice looking picture. Oh well. 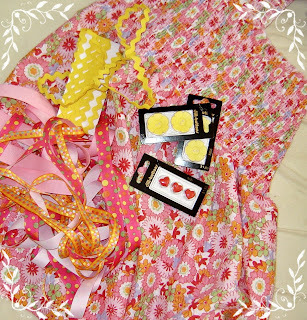 Any crafting mama knows that the crafting is easy. Its the photographing of the children that is the hard part. I don't know why I even bother trying!! Hippity Hoppity, Easters on its way! I haven't had a chance to do the Easter Bunny thing before. 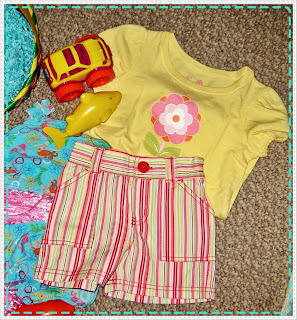 Gracie was only 11 months old for her first Easter and frankly, I forgot it was Easter entirely! 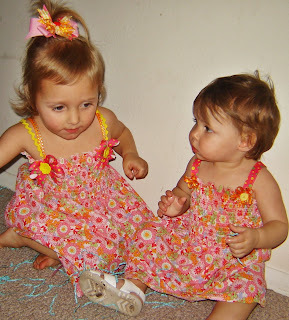 Last Easter, Gracie was not quite two, Annelie was two months... and we were stuck in a car driving from Oklahoma City back to Austin after we were all in my best friend Jenni's wedding. We did have Easter brunch -- in a cheap and greasy diner along the way -- but we skipped the whole Easter basket thing. This year, I decided to go all out. 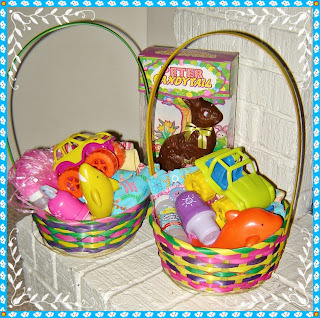 Gracie helped pick out the baskets and I had some fun choosing all the goodies to go in them. Here in Texas it is already hot and sunny. 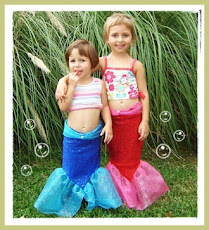 I decided to do a summer theme and get the girls ready for all the fun they will be having at the pool this year. 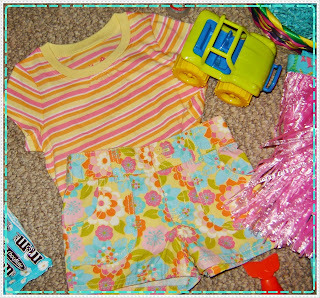 I bought them each a bright and cheerful summer outfit, a mermaid bathing suit with matching hot pink hula skirt (because seriously, what little girl can possibly go without one of those??? 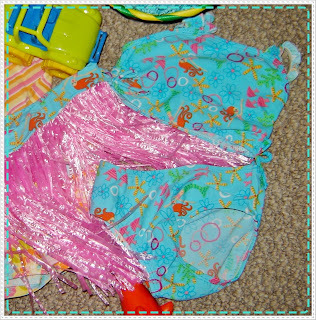 ), and a handful of water toys and bubbles! 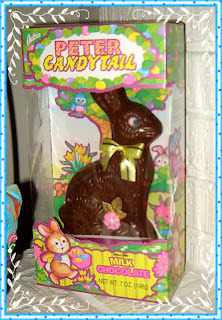 And a huge chocolate bunny, because Easter just isn't Easter without a huge chocolate bunny. And of course, I packed up the eggs for Gracie's first annual Easter egg hunt! I was cracking up as I inserted two m&ms into each egg, knowing that Gracie was going to be in candy heaven even though E. Bunny was awfully chinzy on the candy dosage. But seriously... what is Easter without eating candy for breakfast and having sugar-rushes all throughout the day! One day of unfiltered spoiling certainly doesn't hurt. And, as Gracie is finally at the age where she is building permanent and long-lasting memories, I just like knowing that her day was filled with magic, egg-hunting adventure, hula skirt twirling, and sugar-coated smiles all day long. Will had to have his Biometrics (thats fancy talk for fingerprinting, photographing, and all around having the government keep tabs on my immigrant husband) done yesterday and the nearest immigration center is San Antonio which is an hour away from Austin. Since he had to take the day off work, we decided to make it a fun family day. San Antonio is probably my favorite part of Texas. The city is old (by US standards, of course) and very picturesque. The Alamo, famous as the fort in which Davy Crockett fought to defend and died while trying back in 1836, is in the center of the lovely historical city (yes, he was a true historical figure and not just a Tall Tale!!). 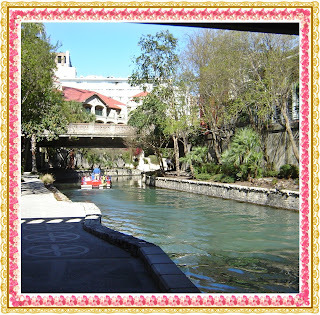 And the River Walk, which is a network of walkways around the San Antonio River- one story beneath downtown- is lined by restaurants and shops and is such a lively and fun place see. We've been talking about taking this trip for the last couple of weeks and I was really, really looking forward to it all. But then all the plans changed. Will decided to be adamant that we bring the family dog, Willie. Okay, so I haven't mentioned anytime in the last month that we have a new dog. Here is something new to learn about me: I'm a cat person. The line between cat people and dog people is generally very, very thickly drawn. Will and I are no exceptions to the rule. 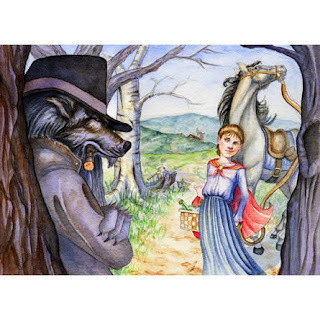 He grew up adoring faithful, sloppery, and ground worshipping dogs... I grew up adoring independent, free-spirited, and affectionate-without-being-obnoxiously worshipful cats. Willie is a nice dog. Don't get me wrong... but I still didn't see why he had to come with us. However, as Will was being an adamant pain-in-the-arse, Willie hopped into Darren the Dodge Caravan and made the trip right along side us. The wait at Immigration was very much like the long and boring wait at the DMV. 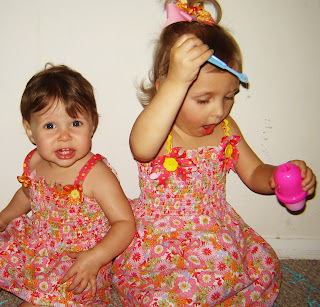 By the time we were done, I had spent almost two hours chasing the girls around, trying to keep them quiet. And we were all starving, so we drove about 15 more minutes into the heart of the city of San Antonio so we could park and find a place to eat. Now, I'd had my heart set on eating along the River Walk, but now that Willie was with us, I feared my plans wouldn't work out. 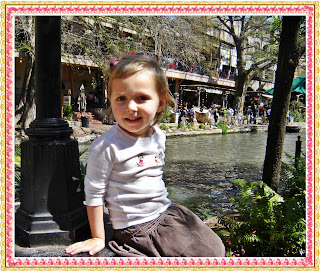 Will confirmed that when he said there are no dogs allowed, even in the river-lined patios of the River Walk's numerous cantinas and restaurants. Our only option at this point was to hit up MacDonalds and eat in the park. And after that... we just went home. 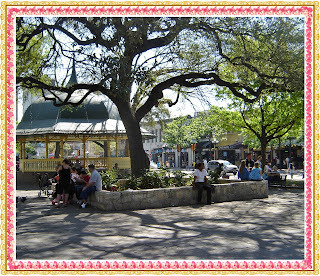 No museums, no historical sites to see, no shops or lovely walk around the Alamo gardens... just home. But first, we had to walk a mile back to the car. And since I was holding Gracie, who is the size of a tank, I was just exhausted. I finally asked Will to run ahead with the dog and get the car so I wouldn't have to drag the kids further. Forty-five minutes later, he came back... still on foot. "I don't know where the car is," he said. 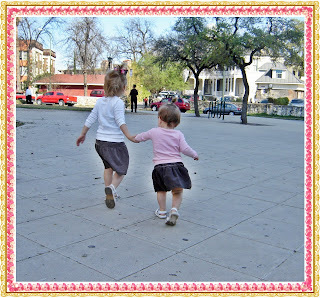 So off we went, me leading the way and carrying Gracie again, Annelie screaming her head off because she wanted to walk herself, and Will plodding along with the dog, as if this was the happiest family day ever. 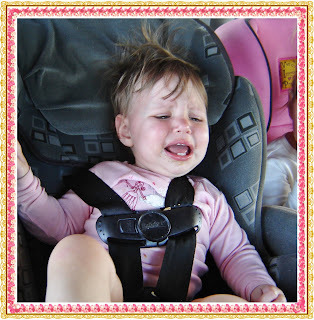 And, of course Annelie screamed the whole way home. 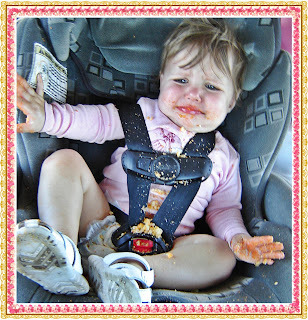 Until I quieted her with some Cheese Puffs. But then she carried on crying. 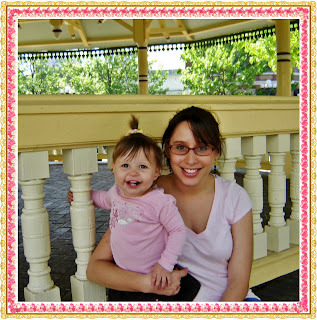 When it comes to being a mom, I've learned to put on a happy face. The kids (and myself) may have been hungry, tired, and cranky for 90% of the day, but at least I forced a few happy pictures. The girls are surely not going to remember this uneventful day, but the happy little photos will live on!! 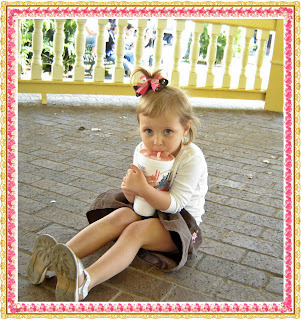 Plus, I let Gracie have a huge strawberry milkshake for being such a good girl. 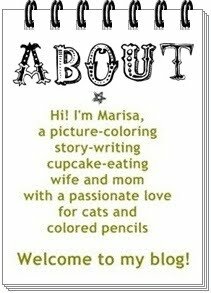 Labels: All About Me, I Can Haz Petz? 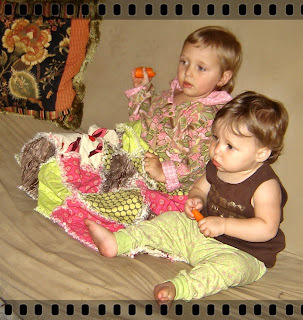 Looking at my daughters vegged out in front of the television probably isn't supposed to bring tears of joy to my eyes. In fact, the glazed eyes glued to the screen is generally something I should feel guilty about. However, when Gracie and Annelie sat down to watch the 1999 version of Annie, I couldn't help but snap a picture of this momentous occasion. You see, I have been trying to foster a love for musical theatre in my "little girls, little girls" -- as Miss Hannigan sings-- since they were born. And it will never fail to make me proud when they just can't get enough of the singing and dancing. Even Annelie, who never tolerates TV for more than a minute, sat down and watched four music numbers from Annie in a row. My love for musicals goes back before I can even remember. My mom used to put my big brother and I in front of The Sound of Music, back when I was in preschool. When I was five, I was finally old enough to see a live production. Sitting in the huge theatre, with the stage decked out like a street alley, I got chills which I can still remember over twenty years later. And once the stage was filled with fabulously dressed felines, and they broke out into their first song and dance number, I was completely enchanted. 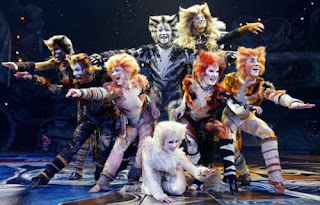 To this day, when it comes to musicals, Cats will always hold the biggest spot in my heart. That was only the tip of the ice burg that is my passion for musicals. 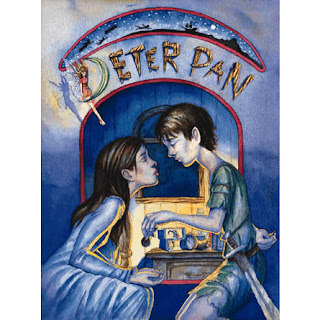 By the time I was seven, I had seen Peter Pan (starring Cathy Rigby-- wow!!) and The Secret Garden. Soon after, I saw Brigadoon, The Sound of Music, Seven Brides for Seven Brothers, and The Phantom of the Opera. Flying to NYC to see Les Miserables and Beauty and the Beast on Broadway was my high school graduation present. And the first thing I did when I arrived in the UK for my study abroad in college, was to book tickets to see The Lion King and Les Miserables (what can I say... its a classic!) in London. Gracie was only two when I played a live recording of Cats for her. And "The Lonely Goatherd" from The Sound of Music was on special request from my darling, and oh so cultured, daughter for the longest time. Annie, however, is a different story altogether. Gracie wants to hear the music at all times. And when the orphans get up and dance, she dances too. She wants to wear her tiny tap shoes so she can tap along during, "You're Never Fully Dressed Without A Smile," and she always has to wear a flowing dress that she can shimmy and shake in during "Easy Street." Of course, "Its the Hard Knock Life," entrances us all. I look forward to finding other musicals which will one day capture my daughter's hearts. And of course, I look forward to the day Gracie and Annelie can sit still in a theatre long enough to be entranced when the lights go down and the curtain goes up and a magical, musical world begins. In the meantime, I'm just so proud of my little girls, little girls as they veg out in front of a musical classic. For those interested in showing Annie to your own young children, I strongly recommend the 1999 version, as Miss Hannigan isn't as frightening or drunk during the entire movie as the 1982 version. While I do admit that Carol Burnett is the best Miss Hannigan, her angry drunken moments are not exactly what I want my kids to experience! !